The Justice and Development Party (Turkish: Adalet ve Kalkınma Partisi), abbreviated officially AK Parti in Turkish, is a conservative, authoritarian political party in Turkey. Developed from the conservative tradition of Turkey's Ottoman past and its Islamic identity, the party is the largest in Turkey. Founded in 2001 by members of a number of existing conservative parties, the party has won pluralities in the six most recent legislative elections, those of 2002, 2007, 2011, June 2015, November 2015, and 2018. The party held a majority of seats for 13 years, but lost it in June 2015, only to regain it in the snap election of November 2015 but then lose it again in 2018. Its electoral success has been mirrored in the three local elections held since the party's establishment, coming first in 2004, 2009 and 2014 respectively. The current party leader is Recep Tayyip Erdoğan, the incumbent President of Turkey. Shortly after formation, the AKP portrayed itself as a pro-Western, pro-American party in the Turkish political spectrum that advocated a liberal market economy including Turkish membership in the European Union. The party had for a long time been supported by the Cemaat Movement of exiled Islamic cleric Fethullah Gülen, whose influence in the judiciary has helped to weaken the opposition against the AKP. The party was an observer in the center-right European People's Party between 2005 and 2013 and a member of the Eurosceptic Alliance of Conservatives and Reformists in Europe (ACRE) from 2013 to 2018. Nationwide protests broke out against the alleged authoritarianism of the AKP in 2013, with the party's heavy-handed response receiving international condemnation and stalling the party's once championed EU accession negotiations. Since then, the party has brought about tighter regulations on internet use, abortion and alcohol consumption, having temporarily blocked access to Twitter and YouTube in March 2014. Especially after the government corruption scandal involving several AKP ministers in 2013, the party has been increasingly accused of crony capitalism. The AKP favours a strong centralized leadership, having long advocated a presidential system of government and significantly reduced the number of elected local government positions in 2013. The AKP was established by a wide range of politicians of various political parties and a number of new politicians.[when?] The core of the party was formed from the reformist faction of the Islamist Virtue Party, including people such as Abdullah Gül, Bülent Arınç. A second founding group consisted of members of the social conservative Motherland Party who had been close to Turgut Özal, such as Cemil Çiçek and Abdülkadir Aksu. Some members of the True Path Party, such as Hüseyin Çelik and Köksal Toptan, joined the AKP. Some members, such as Kürşad Tüzmen had nationalist or Ertuğrul Günay, had center-left backgrounds while representatives of the nascent 'Muslim left' current were largely excluded. In addition a large number of people joined a political party for the first time, such as Ali Babacan, Selma Aliye Kavaf, Egemen Bağış and Mevlüt Çavuşoğlu. All of these people joined Recep Tayyip Erdoğan to found the new party. Although the party is described as an Islamist party in some media, party officials reject those claims. According to former minister Hüseyin Çelik, "In the Western press, when the AKP administration – the ruling party of the Turkish Republic – is being named, unfortunately most of the time 'Islamic,' 'Islamist,' 'mildly Islamist,' 'Islamic-oriented,' 'Islamic-based' or 'with an Islamic agenda,' and similar language is being used. These characterizations do not reflect the truth, and they sadden us." Çelik added, "The AKP is a conservative democratic party. The AKP's conservatism is limited to moral and social issues." Also in a separate speech made in 2005, Prime Minister Recep Tayyip Erdoğan stated, "We are not an Islamic party, and we also refuse labels such as Muslim-democrat." Erdoğan went on to say that the AKP's agenda is limited to "conservative democracy". The party's foreign policy has also been widely described as Neo-Ottomanist, an ideology that promotes renewed Turkish political engagement in the former territories of its predecessor state, the Ottoman Empire. However, the party's leadership has also rejected this label. In 2005, the party was granted observer membership in the European People's Party (EPP). In November 2013, the party left the EPP to join the Alliance of European Conservatives and Reformists (now Alliance of Conservatives and Reformists in Europe) instead. This move was attributed to the AKP's disappointment not to be granted full membership in the EPP, while it was admitted as a full member of the AECR. It drew criticism in both national and European discourses, as the driving force of Turkey's aspirations to become a member of the European Union decided to join a largely eurosceptic alliance, abandoning the more influential pro-European EPP, feeding suspicions that AKP wants to join a watered down, not a closely integrated EU. The Justice and Development Party has faced two closure cases in its history. Just 10 days before the national elections of 2002, Turkey's chief prosecutor, Sabih Kanadoğlu, asked the Turkish constitutional court to close the Justice and Development Party, which was leading in the polls at that time. The chief prosecutor charged the Justice and Development Party with abusing the law and justice. He based his case on the fact that the party's leader had been banned from political life for reading an Islamist poem, and thus the party had no standing in elections. The European Commission had previously criticised Turkey for banning the party's leader from participating in elections. The party again faced a closure trial in 2008. At an international press conference in Spain, Erdoğan answered a question of a journalist by saying, "What if the headscarf is a symbol? Even if it were a political symbol, does that give [one the] right to ban it? Could you bring prohibitions to symbols?" These statements led to a joint proposal of the Justice and Development Party and the far-right Nationalist Movement Party for changing the constitution and the law to lift a ban on women wearing headscarves at state universities. Soon afterwards, Turkey's chief prosecutor, Abdurrahman Yalçınkaya, asked the Constitutional Court of Turkey to close down the party on charges of violating the separation of religion and state in Turkey. The closure request failed by only one vote, as only 6 of the 11 judges ruled in favour, with 7 required; however, 10 out of 11 judges agreed that the Justice and Development Party had become "a center for anti-secular activities", leading to a loss of 50% of the state funding for the party. The AKP won a sweeping victory in the 2002 elections, which saw every party previously represented in the Grand National Assembly ejected from the chamber. In the process, it won a two-thirds majority of seats, becoming the first Turkish party in 11 years to win an outright majority. Erdoğan, as the leader of the biggest party in parliament, would have been normally given the task to form a cabinet. However according to the Turkish Constitution Article 109 the Prime Ministers had to be also a representative of the Turkish Parliament. Erdagan, who was banned from holding any political office after a 1994 incident in which he read a poem deemed pro-Islamist by judges, was therefore not. As a result, Gül became prime minister. It survived the crisis over the 2003 invasion of Iraq despite a massive back bench rebellion where over a hundred AKP MPs joined those of the opposition Republican People's Party (CHP) in parliament to prevent the government from allowing the United States to launch a Northern offensive in Iraq from Turkish territory. Later, Erdoğan's ban was abolished with the help of the CHP and Erdoğan became prime minister by being selected to parliament after a by-election in Siirt. The AKP has undertaken structural reforms, and during its rule Turkey has seen rapid growth and an end to its three decade long period of high inflation rates. Inflation had fallen to 8.8% by 2004. Influential business publications such as The Economist consider the AKP's government the most successful in Turkey in decades. In the local elections of 2004, the AKP won 42% of the votes, making inroads against the secular Republican People's Party (CHP) on the South and West Coasts, and against the Social Democratic People's Party, which is supported by some Kurds in the South-East of Turkey. In January 2005, the AKP was admitted as an observer member in the European People's Party (EPP). However, it left the EPP to join the Alliance of European Conservatives and Reformists (AECR) in 2013. Voter base by monthly household income. AKP is the largest party in group 1, 2, 3 and 4, while CHP is the largest in group 5, the richest 20% of Turkey. 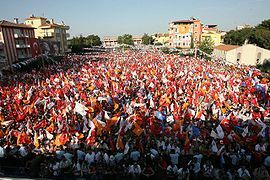 On April 14, 2007, an estimated 300,000 people marched in Ankara to protest the possible candidacy of Erdoğan in the 2007 presidential election, afraid that if elected as President, he would alter the secular nature of the Turkish state. Erdoğan announced on April 24, 2007 that the party had decided to nominate Abdullah Gül as the AKP candidate in the presidential election. The protests continued over the next several weeks, with over one million reported at an April 29 rally in Istanbul, tens of thousands reported at separate protests on May 4 in Manisa and Çanakkale, and one million in İzmir on May 13. Early parliamentary elections were called after the failure of the parties in parliament to agree on the next Turkish president. The opposition parties boycotted the parliamentary vote and deadlocked the election process. At the same time, Erdoğan claimed the failure to elect a president was a failure of the Turkish political system and proposed to modify the constitution. The AKP achieved victory in the rescheduled July 22, 2007 elections with 46.6% of the vote, translating into control of 341 of the 550 available parliamentary seats. Although the AKP received significantly more votes in 2007 than in 2002, the number of parliamentary seats they controlled decreased due to the rules of the Turkish electoral system. However, they retained a comfortable ruling majority. "No Stopping, Push On!" was the slogan of the Justice and Development Party in the general elections of 2007. Territorially, the elections of 2007 saw a major advance for the AKP, with the party outpolling the pro-Kurdish Democratic Society Party in traditional Kurdish strongholds such as Van and Mardin, as well as outpolling the secular-left CHP in traditionally secular areas such as Antalya and Artvin. Overall, the AKP secured a plurality of votes in 68 of Turkey's 81 provinces, with its strongest vote of 71% coming from Bingöl. Its weakest vote, a mere 12%, came from Tunceli, the only Turkish province where the Alevi form a majority. Abdullah Gül was elected President in late August with 339 votes in the third round – the first at which a simple majority is required – after deadlock in the first two rounds, in which a two-thirds majority is needed. After the opposition parties deadlocked the 2007 presidential election by boycotting the parliament, the ruling AKP proposed a constitutional reform package. The reform package was first vetoed by President Sezer. Then he applied to the Turkish constitutional court about the reform package, because the president is unable to veto amendments for the second time. The court did not find any problems in the package and 69% of the voters supported the constitutional changes. reducing the quorum of lawmakers needed for parliamentary decisions from 367 to 184. The Turkish local elections of 2009 took place during the financial crisis of 2007–2010. After the success of the AKP in the 2007 general elections, the party saw a decline in the local elections of 2009. In these elections the AKP received 39% of the vote, 3% less than in the local elections of 2004. Still, the AKP remained the dominating party in Turkey. The second party CHP received 23% of the vote and the third party MHP received 16% of the vote. The AKP won in Turkey's largest cities: Ankara and Istanbul. Reforming the Constitution was one of the main pledges of the AKP during the 2007 election campaign. The main opposition party CHP was not interested in altering the Constitution on a big scale, making it impossible to form a Constitutional Commission (Anayasa Uzlaşma Komisyonu). The amendments lacked the two-thirds majority needed to instantly become law, but secured 336 votes in the 550 seat parliament – enough to put the proposals to a referendum. The reform package included a number of issues: such as the right of individuals to appeal to the highest court, the creation of the ombudsman's office, the possibility to negotiate a nationwide labour contract, positive exceptions for female citizens, the ability of civilian courts to convict members of the military, the right of civil servants to go on strike, a privacy law, and the structure of the Constitutional Court. The referendum was agreed by a majority of 58%. In the presidential election of 2014, the AKP's long time leader Recep Tayyip Erdoğan was elected President. In the party's first extraordinary congress, former foreign minister Ahmet Davutoğlu was unanimously elected unopposed as party leader and took over as Prime Minister on 28 August 2014. Davutoğlu stepped down as Prime Minister on 4 May 2016 following policy disagreements with President Erdoğan. Presidential aide Cemil Ertem said to Turkish TV that the country and its economy would stabilize further "when a prime minister more closely aligned with President Erdoğan takes office". In the general election held on 7 June, the AKP gained 40.87% of the vote and 258 seats in the Grand National Assembly of Turkey (Turkish: Türkiye Büyük Millet Meclisi, TBMM). Though it still remains the biggest party in Turkey, the AKP lost its status as the majority party and the power to form a single-party government. Until then it had held this majority without interruption for 13 years since it had come to power in 2002. Also, in this election, the AKP was pushing to gain 330 seats in the Grand National Assembly so that it could put a series of constitutional changes to a referendum, one of them was to switch Turkey from the current parliamentary government to an American-style executive presidency government. This pursuit met with a series of oppositions and criticism from the opposition parties and their supporters, fearing the measure would give more unchecked power to the current President of Turkey Recep Tayyip Erdoğan, who has been drawing fierce criticisms both from home and abroad for his active role in the election, abandoning the traditional presidential role of maintaining a more neutral and impartial position in elections by his predecessors in the office. The result of the Kurdish issues-centred Peoples' Democratic Party (Turkey), HDP, breaking through the 10% threshold to achieve 13.12% out of the total votes cast and gaining 80 seats in the Grand National Assembly in this election successfully derailed the AKP from maintaining its hold of power as the majority party and a single-party government as well as enacting a referendum necessary to change the constitution. The AKP is now forced to form a coalition government in negotiation with other parties. In September 2012, two-year-old conservative-oriented People's Voice Party (HAS Parti) dissolved itself and joined the ruling Justice and Development Party (AKP) with a majority of its delegates' votes. In July 2012, following long-held speculation that former HSP leader Numan Kurtulmuş was on Prime Minister Erdoğan's mind as his possible successor as party head, Erdoğan personally proposed to Kurtulmuş the idea of merging the parties under the umbrella of the AKP. Critics have accused the AKP of having a 'hidden agenda' despite their public endorsement of secularism and the party maintains informal relations and support for the Muslim Brotherhood. Both the party's domestic and foreign policy has been perceived to be Pan-Islamist or Neo-Ottoman, advocating a revival of Ottoman culture often at the expense of secular republican principles, while increasing regional presence in former Ottoman territories. The AKP are staunchly "anti-academic" with many academics, researchers and teachers being sacked from their positions since the failed coup attempt in 2016. An alleged 13,000 tons of textbooks were scrapped and the rest expunged of ‘terrorist’ content. Primary, lower secondary and secondary school students spent most of the first day of school watching videos about the ‘triumph of democracy’ over the coup plotters, and listening to speeches equating the civilian counter-coup that aborted the takeover with historic Ottoman victories going back 1000 years. Campaigns are being organised to release higher education personnel and to drop charges against them for peaceful exercise of academic freedom. Imprisoning of political activists continue, the chair of Amnesty Turkey has been jailed for standing up to the AKP on trumped up "terrorist charges". These charges have drawn widespread international condemnation, including from the US State Department, the EU and many international and domestic human rights organisations. ^† "AK PARTİ" (in all capital letters) is the self-declared abbreviation of the name of the party, as stated in Article 3 of the party charter, while "AKP" is mostly preferred by its opponents; the supporters prefer "AK PARTİ" since the word "ak" in Turkish means "white", "clean", or "unblemished," lending a positive impression. The Chief Public Prosecutor of the Supreme Court of Appeals initially used "AKP", but after an objection from the party, "AKP" was replaced with "Adalet ve Kalkınma Partisi" (without abbreviation) in documents. Cizre, Ümit (2012). "A New Politics of Engagement: The Turkish Military, Society and the AKP". Democracy, Islam, and Secularism in Turkey. Hale, William; Özbudun, Ergun (2010). "Islamism, Democracy and Liberalism in Turkey: The Case of the AKP". Routledge. Yavuz, M. Hakan (2009). "Secularism and Muslim Democracy in Turkey". Cambridge University Press. ^ a b "AK PARTİ". yargitaycb.gov.tr. Retrieved 4 January 2018. ^ Hüseyin Şengül. "AKP mi, AK Parti mi?". bianet.org. Retrieved 25 April 2018. ^ Tepe, Sultan (2005). "Turkey's AKP: A Model "Muslim-Democratic" Party?". JHU Press: 69–82. ^ "AKP yet to win over wary business elite". Financial Times. 8 July 2007. ^ Cagaptay, Soner (2014). The Rise of Turkey. Potomac Books. p. 117. ^ Yavuz, M. Hakan (2009). Secularism and Muslim Democracy in Turkey. Cambridge University Press. p. 105. ^ Abbas, Tahir (2016). Contemporary Turkey in Conflict. Edinburgh University Press. ^ Bayat, Asef (2013). Post-Islamism. Oxford University Press. p. 11. Konak, Nahide (2015). Waves of Social Movement Mobilizations in the Twenty-First Century: Challenges to the Neo-Liberal World Order and Democracy. Lexington Books. p. 64. Jones, Jeremy (2007). Negotiating Change: The New Politics of the Middle East. I.B. Tauris. p. 219. ^ a b Osman Rifat Ibrahim. "AKP and the great neo-Ottoman travesty". Al Jazeera. Retrieved 7 June 2015. ^ Yavuz, M. Hakan (1998). "Turkish identity and foreign policy in flux: The rise of Neo‐Ottomanism". Critique: Critical Middle Eastern Studies. 7 (12): 19–41. doi:10.1080/10669929808720119. ^ Kardaş, Şaban (2010). "Turkey: Redrawing the Middle East Map or Building Sandcastles?". Middle East Policy. 17: 115–136. doi:10.1111/j.1475-4967.2010.00430.x. ^ Cook, Steven A. (2012). "Recent History: The Rise of the Justice and Development Party". U.S.-Turkey Relations: A New Partnership to. Council on Foreign Relations: 52. ^ Göçek, Fatma Müge (2011). "The Transformation of Turkey: Redefining State and Society from the Ottoman Empire to the Modern Era". I.B. Tauris: 56. Tocci, Nathalie (2012). "Turkey and the European Union". The Routledge Handbook of Modern Turkey. Routledge: 241. ^ Soner Cagaptay (2015-10-17). "Turkey's divisions are so deep they threaten its future". Guardian. Retrieved 2015-12-27. ^ GlobalSecurity.org - Reliable Security Information. "Justice and Development Party (AKP) Adalet ve Kalkinma Parti (AKP)". GlobalSecurity.org - Reliable Security Information. Retrieved 13 December 2017. Others suggest that that around 60 percent of AKP,s supporters were traditional (non-Islamist) conservatives, around 15 percent were Islamist-oriented voters, with the rest mostly swing protest voters upset with corruption in the other parties. ^ a b "New to Turkish politics? Here's a rough primer". Turkish Daily News. 2007-07-22. Archived from the original on 2012-07-08. Retrieved 2008-07-22. ^ "What you should know about Turkey's AKP-Gulen conflict". Al-Monitor. 3 January 2014. Archived from the original on 24 April 2015. Retrieved 7 June 2015. ^ "Erdoğan's AKP party joins Cameron's conservative political family". EURACTIV.com. 2013-11-13. ^ "Conservative Eurosceptic alliance reaches out to far-right". Financial Times. 12 November 2018. ^ Robert Tait (2008-07-30). "Turkey's governing party avoids being shut down for anti-secularism". The Guardian. Retrieved 7 June 2015. ^ "EU delays Turkey membership talks after German pressure". BBC News. 2013-06-25. Retrieved 7 June 2015. "Gezi Park protests: The AKP's battle with Turkish society". The Jerusalem Post. Retrieved 7 June 2015. ^ Kevin Rawlinson (2014-03-21). "Turkey blocks use of Twitter after prime minister attacks social media site". The Guardian. Retrieved 7 June 2015. "Turkey moves to block YouTube access after 'audio leak'". BBC News. 2014-03-27. Retrieved 7 June 2015. "Turkey: What's Behind the AKP's New Anti-Abortion Agenda?". EurasiaNet.org. Retrieved 7 June 2015. Jenna Krajeski (14 February 2014). "The Last Chance To Stop Turkey's Harsh New Internet Law". The New Yorker. Retrieved 7 June 2015. "AKP Wages Jihad Against Alcohol in Turkey". Al-Monitor. 2013-05-23. Retrieved 7 June 2015. ^ "New Turkey and AKP-type capitalism". Today's Zaman. 24 September 2014. Retrieved 7 June 2015. "Mass Murder in Soma Mine: Crony Capitalism and Fetish of Growth in Turkey". politiikasta.fi. Retrieved 7 June 2015. ^ "Presidential system tops AKP's election campaign". Hurriet Daily News. Retrieved 7 June 2015. ^ "Justice and Development Party". Encyclopædia Britannica. Britannica.com. Retrieved 21 July 2014. Unlike its predecessors, the AKP did not centre its image around an Islamic identity; indeed, its leaders underscored that it was not an Islamist party and emphasized that its focus was democratization, not the politicization of religion. ^ "AKP explains charter changes, slams foreign descriptions". Hürriyet Daily News. Istanbul. 2010-03-28. Retrieved 21 July 2014. In the Western press, when the AKP administration, the ruling party of the Turkish Republic, is being named, unfortunately most of the time Islamic agenda,' and similar language is being used. These characterizations do not reflect the truth, and they sadden us," Çelik said. "Yes, the AKP is a conservative democratic party. The AKP's conservatism is limited to moral and social issues. ^ Taşpınar, Ömer (April 24, 2012). "Turkey: The New Model?". Brookings Institution. ^ Taşpınar, Ömer (September 2008). "Turkey's Middle East Policies: Between Neo-Ottomanism and Kemalism". Carnegie Endowment for International Peace. Retrieved 2010-06-05. ^ "I am not a neo-Ottoman, Davutoğlu says". Today's Zaman. Turkey. 2009-11-25. Archived from the original on 2013-10-25. Retrieved 2012-01-09. ^ "Erdoğan's AKP party joins Cameron's conservative political family". EurActiv. 2013-11-13. Retrieved 2015-01-14. ^ Lagendijk, Joost (2013-11-12). "AKP looking for new European friends". Today's Zaman. Archived from the original on 2015-02-11. Retrieved 2015-01-14. ^ Yinanç, Barçin (2013-11-19). "By abandoning conservatives AKP helps anti-Turkey bloc in EU". Hürriyet Daily News. Retrieved 2015-01-14. ^ "Turkey mulls banning leading party before elections". EurActiv. October 23, 2002. Retrieved February 15, 2011. "Closure case against ruling party creates shockwaves". Today's Zaman. 2008-03-15. Archived from the original on 2008-04-21. Retrieved 2008-11-16. "Full text of testimony". Milliyet (in Turkish). Retrieved 2008-09-04. ^ "One million Turks rally against government". Reuters. 2007-04-29. Retrieved 2007-04-30. ^ "Saylan: Manisa mitingi önemli". Milliyet (in Turkish). Retrieved 2007-05-04. ^ "Turks protest ahead of early elections". Swissinfo. Archived from the original on September 30, 2007. Retrieved 2007-05-13. ^ "Turkey: 22 July 2007 – Election Results". BBC Turkish. 2007-07-23. Retrieved 2008-07-22. ^ "AKP'nin Anayasa hedefi 15 madde". NTVMSNBC. 2009-02-17. Retrieved 2009-02-17. ^ "Turkey PM Ahmet Davutoğlu to quit amid reports of Erdoğan rift". BBC News. BBC. 2016-05-05. Retrieved 5 May 2016. ^ "HSP dissolves itself as its leader plans to join the ruling party". Hurriet Daily News. Retrieved 7 June 2015. "Support for Muslim Brotherhood isolates Turkey". Die Weld. Retrieved 7 June 2015. Ömer Taşpınar (1 April 2012). "Islamist Politics in Turkey: The New Model?". The Brookings Institution. Retrieved 7 June 2015. ^ Öztürk, Ahmet Erdi (2016-10-01). "Turkey's Diyanet under AKP rule: from protector to imposer of state ideology?". Southeast European and Black Sea Studies. 16 (4): 619–635. doi:10.1080/14683857.2016.1233663. ISSN 1468-3857. ^ "Düşünmek Taraf Olmaktır". taraf.com.tr. Retrieved 7 June 2015. ^ "AKP'li vekil: Osmanlı'nın 90 yıllık reklam arası sona erdi". Cumhuriyet Gazetesi. 15 January 2015. Retrieved 7 June 2015. ^ "Turkey's War Against the Academics". 2017-06-30. ^ "Taner Kılıç released on bail". ^ "AK PARTİ TÜZÜĞÜ" [AK PARTİ STATUTES] (PDF) (in Turkish). Adalet ve Kalkınma Partisi. Retrieved 2014-09-23. ^ "Less than white?". The Economist. 2008-09-18. Retrieved 2008-09-22. "AK Parti mi, AKP mi? (AK Parti or AKP?)". Habertürk (in Turkish). 2009-06-05. Retrieved 2009-08-10. ^ Ebru Toktar and Ersin Bal. "Laiklik anlayışlarımız farklı" Archived 2011-05-12 at the Wayback Machine (in Turkish). Akşam, 2008-05-07. Wikimedia Commons has media related to Justice and Development Party.